Osteopathic philosophy, let us call it osteopathic thinking or I call it away of life. It focuses on dealing with the root cause not the symptoms. So doctors, therapist of all kinds even politician can use that way of thinking so learning technique will make you a good technician, but thinking osteopathiclly ( dealing with Root cause) make you a good Doctor, good engineer , good politic etc. Osteopathic medicine is a distinctive form of medical care founded on the philosophy that all body systems are interrelated and dependent upon one another for good health. The philosophy of Osteopathy is what sets it apart from other medical disciplines. 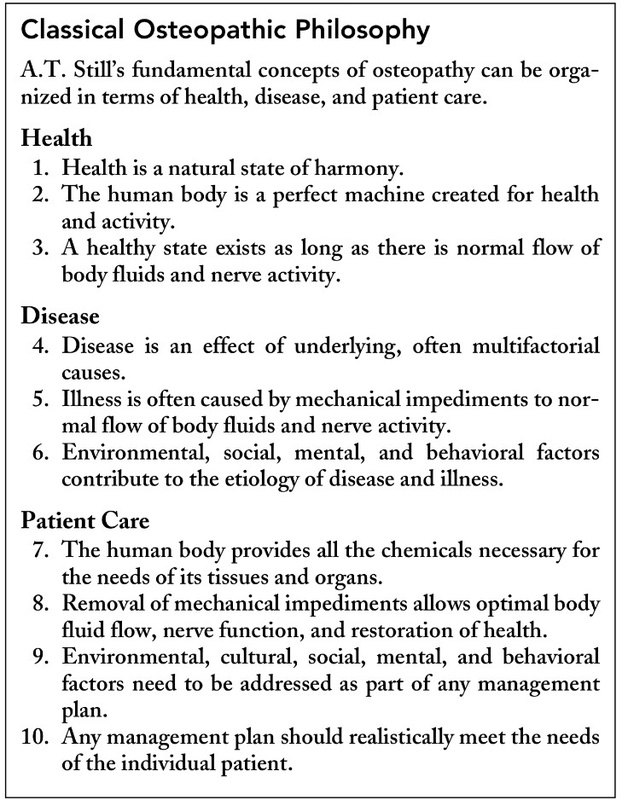 The key principles are based on all parts of the body functioning together in an integrated manner. If one part of the body is restricted, then the rest of the body must adapt and compensate for this, eventually leading to inflammation, pain, stiffness and other health conditions. When the body is free of restrictions in movement, Osteopathic treatment assists the body with pain minimization, reduced stress and greater mobility providing the body with the opportunity to heal itself. Physicians in the mid to late 1800’s understood that the immune system functioned to provide for natural and acquired immunity, to help maintain wellness, to assist in the repair of damaged tissues, and to help the body compensate for irreparable damage. In spite of limited scientific proof at the time, Doctor Still grasped the complex interaction of the nervous, endocrine and immune systems in providing a mechanism for the body to maintain its own health and to self-heal. He saw the duty of the osteopathic physician as one of assisting the body in this endeavor. He understood that the body did not simply exist in a state of health or illness, but was engaged in an ongoing struggle with the demands of its external and internal environments. The body constantly attempts to resist, neutralize or overcome the various stresses to which it is exposed. The degree to which the body is successful in these attempts determines its state of health. If the body can handle stress without excessive demand on itself, then it remains healthy. However, if some discord within the body or a force in the external environment obstructs its adaptability, then disease and illness can occur.